Let’s talk about curriculum. 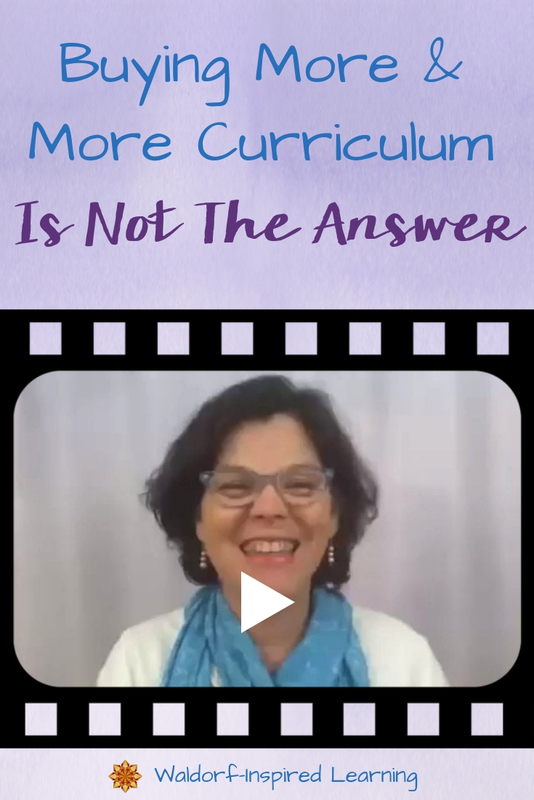 Here’s what we so often hear, “What Waldorf homeschooling curriculum should I buy?” And the asker thinks once they figure that out, they’re done! Good to go. Ready to Waldorf homeschool! Whoa, not quite. And today, I want to talk about why. Hey there, I’m Jean, homeschooling mother of three and enthusiastic Waldorf mentor. I don’t publish curriculum myself, instead my mission is to empower and inspire YOU to customize and even create your own curriculum to suit the needs of your children and family. Watch the video below. Or, if you’d prefer to read instead, the summary is right underneath. I would venture to guess that we all have bookshelves full of resources. Right!?! That’s great! But I would also venture to guess that all of those resources and curricula might not be giving you exactly what you’re looking for. Oftentimes, we continue searching even after the bookshelves are full. Because we think that finding curriculum and resources for Waldorf homeschooling is the end of the preparation process. What we are searching for is not the perfect curriculum! For starters, the perfect homeschooling curriculum doesn’t exist. Because it’s not possible for someone else to write a curriculum for our children. Heck, even if WE wrote a curriculum today for next month, things will change before we get there. What we’re really searching for is confidence and ease. We don’t want to struggle, and somehow we’ve allowed ourselves to believe that the right curriculum will alleviate those feelings of struggle and practically do the teaching for us! Well I’m here to tell you, after almost 25 years of homeschooling, that we really just need to dive in and get on with it. Stop searching for someone else to tell you what to do. And instead, learn about the Waldorf method yourself, and get creative. You could even use the curriculum and resources you already have! The Waldorf method of education and homeschooling goes way beyond the curriculum. And the truth is, the most important part of the curriculum isn’t the plan on paper, but what gets carried out and what our children learn from those experiences. So how do we move toward “understand and create”? How do we become the curriculum creators? By first understanding the foundation of Waldorf principles so that we can create a main lesson block around any beautiful book, or any subject. We want to embrace these, no matter what curriculum or resources we might use. #1 Start with Rhythm and how it guides our seasons, weeks, day, and lessons. #2 Understand the stages of child development so you can observe what YOUR children need & create lessons for them. #3 Learn to weave the lively arts into all your lessons and daily life. Our job as homeschooling parents is to create the space for learning and offer opportunities to our children. And it’s important to know that you can create your own main lessons that suit your particular child or children and family. Does this mean we should avoid buying curriculum all together? No, not necessarily. But it might mean we need to shift our attitudes a bit! To empower ourselves to create our own curriculum or customize what we have. I hope this encourages you to use the curriculum and resources you already have! Or go to the library. Or buy a few key resources for specific blocks you plan on doing. Because finding curriculum and resources for Waldorf homeschooling is only the beginning of the process. If you want to hear more about how I approach Waldorf homeschooling, join me for my new free masterclass The 3 Most Common Mistakes in Waldorf Homeschooling…& What to Do Instead. Want to share this or pin it for later? Click the Save button on the image below to save it on Pinterest.